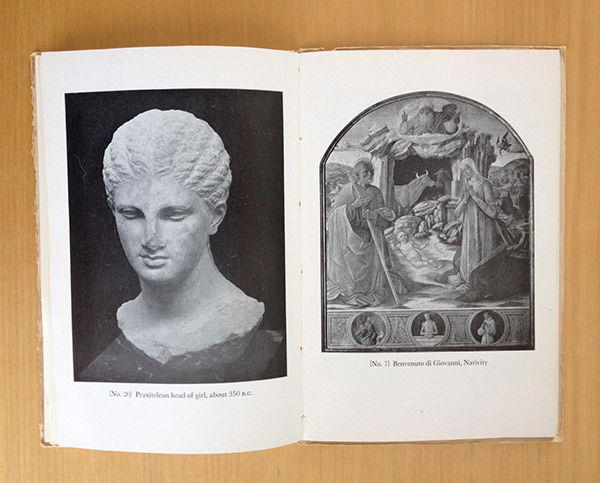 Sixty years ago, the J. Paul Getty Museum opened its doors and launched its publishing program. At that time the Museum occupied J. Paul Getty’s ranch-style house in Pacific Palisades, near lemon groves and two caged bears. 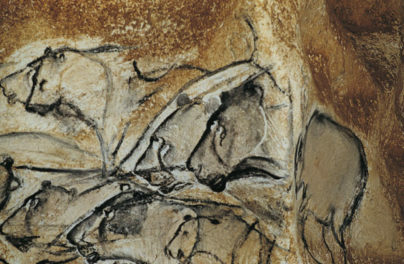 A lot has changed since then: the bears have moved out and the art has moved next door. 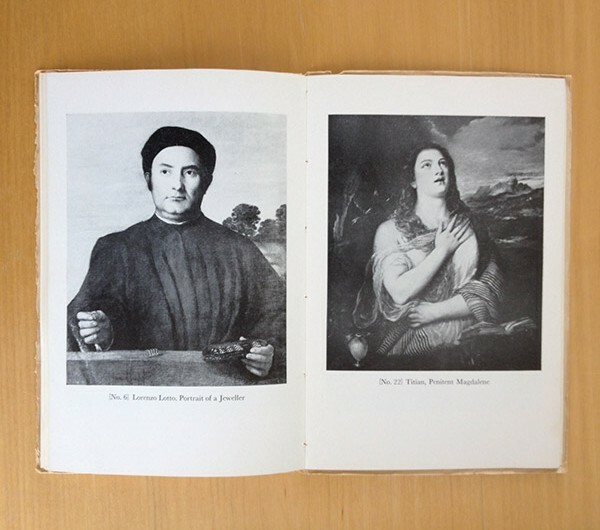 The first and second editions of The J. Paul Getty Museum Guidebook, published in 1954 and 1956, provide a glimpse of what it must have been like to visit the newly opened Museum, as well as of the earliest days of publishing at the Getty. The text of the first edition—which includes phrases like, “From the hallway we enter the lecture hall where the walls are decorated with a number of Italian and Dutch paintings”—guides the reader on a walking tour of the collection, proceeding from the courtyard through the galleries, which were organized by geography and object type. This kind of narrative tour is the ancestor of the current GettyGuide Multimedia Player and the Highlights of the Collection app. 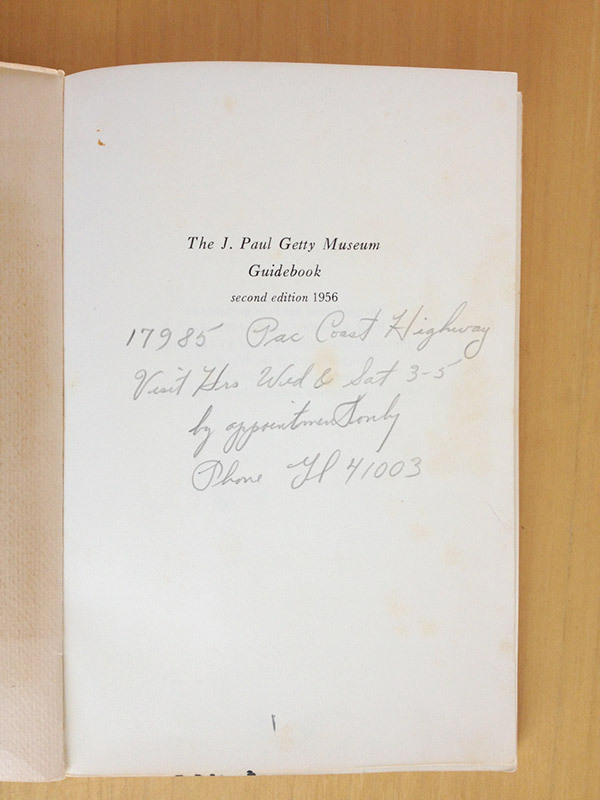 Aside from hinting at the telephone exchange name in 1950s Pacific Palisades—Gladstone 4—this bit of marginalia shows that a keen visitor planned a trip back to the Museum, perhaps with the guidebook in tow. The language of the early guides prepares the reader for an encounter with the Getty’s collection, which at the time was concentrated in the areas of French eighteenth-century decorative arts, ancient Greek and Roman sculpture, and European painting from the Middle Ages through the eighteenth century. Here’s an example from the 1954 introduction: “Visitors confronted with these products of completely different cultures, will by preference be more inclined to one than to the other.” But, the guide reminds us, thanks to “the catholicity of modern man’s unique historical perspective,” “it is today quite possible to admire both types of art when they are represented by masterpieces of the first rank.” Mention of modern man’s liberal tastes may sound a bit outdated to us today, but the goal of inspiring visitors to enjoy and understand art from other times and places remains central to the Getty’s mission. 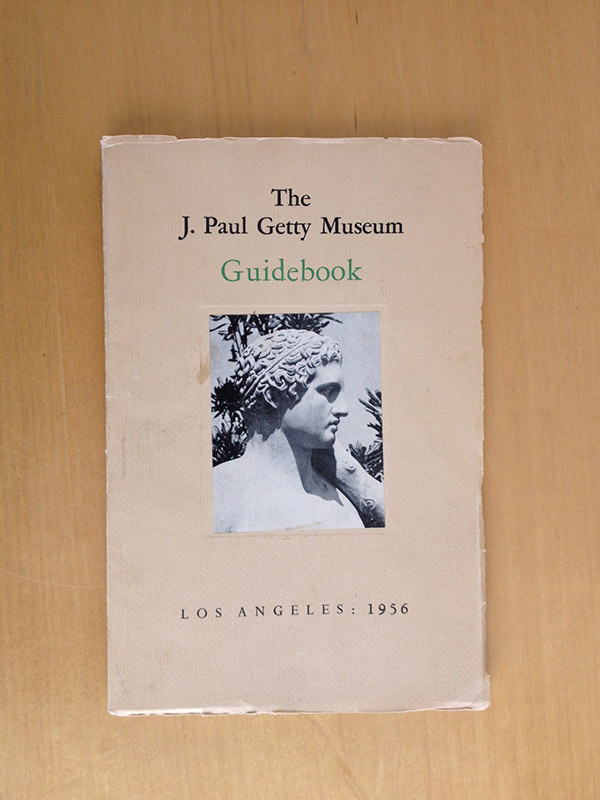 The 1956 guidebook illustrates thirty objects, one-tenth the number in the current edition of The J. Paul Getty Museum Handbook of the Collections. 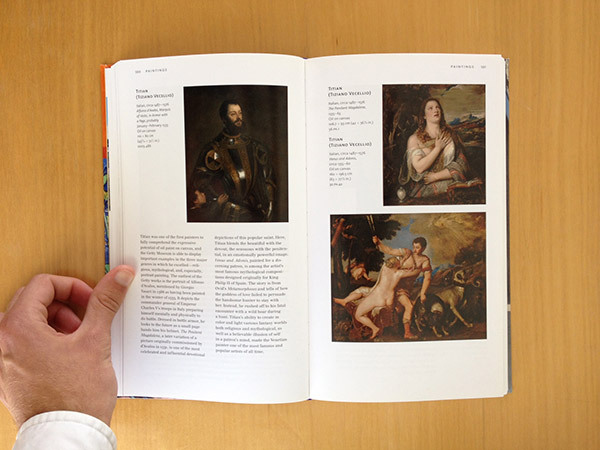 Several of the works in the second edition of the guidebook are also featured in this latest edition, including Titian’s Penitent Magdalene and the head of a young woman from a Greek grave monument. 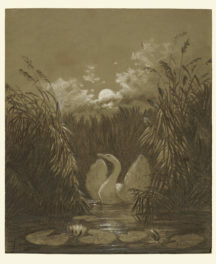 The inclusion of these artworks in both guides gives us a glimpse of the continuity of the Museum’s collection as it has grown from its earliest days to the present. 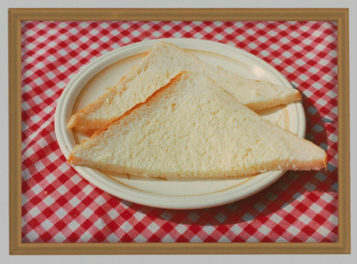 But the works are presented quite differently. 1950s printing technology often dictated that text and images be printed on different kinds of paper, so readers of the earliest guides needed to flip back and forth to match text descriptions with images in the section of black-and-white plates. In the current edition, text and image share space on the same page. Each format lends itself to a different experience of the Museum, too. The reader of the current handbook has a compact resource that is also a souvenir of the visit, whereas the 1950s reader could carry the guidebook as a reference during the visit and then study the illustrations later, over a milkshake. Both of the first and second editions of the guidebook have just joined our Virtual Library, which now contains over 270 titles available for download. 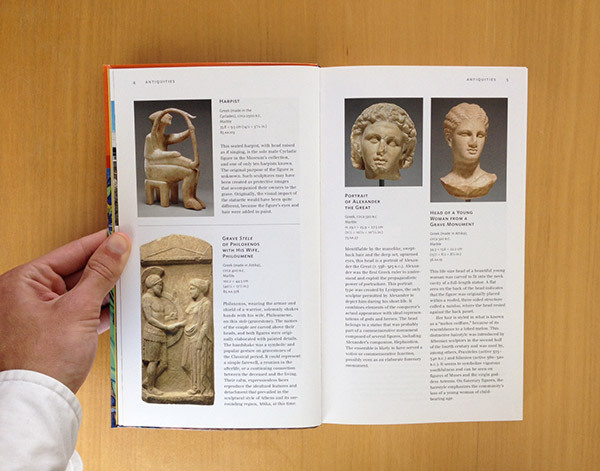 Have a look for some first-hand insight into the evolution of the museum guidebook over the past sixty years. These earliest views on the J. Paul Getty Museum’s collection are now at your fingertips anytime, not just on Wednesdays and Saturdays between 3 and 5.